The articles here explain how to play fantasy football so anyone can enjoy this new and growing pastime. Fantasy football is always played and scored based on real NFL statistics, but there are numerous different formats that will affect how you should draft your team. In this section, we describe how to play fantasy football with the typical and most popular sets of league rules and scoring systems. You’ll learn the difference between standard scoring leagues and PPR leagues, season long vs daily, and other facets of fantasy football! 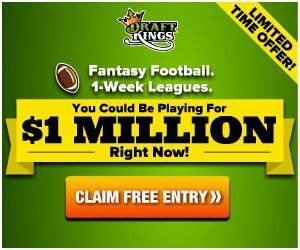 You will also find out how to play in the various real money daily and weekly fantasy leagues offered by the top fantasy sports sites. We explain the typical rules and scoring systems employed by the fantasy sites so you can determine where to play online. Be sure to consult our Glossary of Fantasy Football terms if you need help with our terminology. The ultimate guide on how to play fantasy football in traditional season-long leagues. Daily Fantasy Sports Glossary - Are we using a term, abbreviation, or acronym that is unfamiliar? Look it up here.